EDINBURGH, Scotland, 2018-Mar-13 — /Travel PR News/ — A historic country house in Moray Speyside which was used for army training during World War Two is celebrating after being given Five-Star Guest House status by the national tourism organisation. Blervie House, at Forres, received the accolade from VisitScotland under its Quality Assurance scheme at its first ever grading. The property comprises nine bedrooms and a two-bedroomed suite. Blervie is a Historic Environment Scotland listed country house set in a stunning rural setting at Rafford. Owners Graham and Sheena Thompson bought the property in 2014 and spent three years renovating it to meet 21st century demands, without spoiling the character and relaxed atmosphere that Blervie House exhibits. The house itself sits in nearly 300 acres of grounds and has extensive views over the Moray Firth and Scotland’s north coast. Lucky guests might even catch a glimpse of resident feathered friend, Charlie the peacock. All bedrooms boast wonderful views and contain top-quality furnishings, many of which have an interesting story to tell. Toiletries in the rooms are supplied by Ness Soaps, part of Calman Trust, a social enterprise helping young people in the Highlands – something important to Sheena and Graham and very relevant during Scotland’s Year of Young People. While renovating the house, significant memorabilia was discovered indicating Blervie had been used during WW2 for army training – yet another chapter of the house’s history waiting to be told. Visitors can see many original features around the property – a dumb waiter, the original safe (the same make that set sail on the Titanic), the original ovens and the servant’s bells. The house has five lounges and a full-sized billiard table for the use of guests, as well as croquet equipment for fair-weather days. There is also a barbecue/picnic area and garden. The property has free Wi-fi in all areas and free parking for any size of vehicle. Nearby, visitors can enjoy woodland walks, as well as access to beaches, cycling, walking, fishing, golf, horse riding, mountain biking, river rafting, shopping, sightseeing and the theatre. Blervie House is also a member of VisitScotland’s Information Partner Programme (VIP). Launched in May 2016, the VIP programme ties in with VisitScotland’s global Spirit of Scotland campaign and harnesses the local knowledge, warmth and enthusiasm of partners across the country to help visitors receive the warmest of welcomes and make the most of their trip to Scotland. Visitor attractions, accommodation providers and social enterprises have all joined the scheme to help ensure visitors receive first-class information about the local region and Scotland as a whole. Sheena and Graham also hold a Taste Our Best (TOB) award at Blervie House, in recognition of its use of quality Scottish produce. A joint initiative between VisitScotland and the Scottish Government, TOB is designed to recognise businesses including hotels, restaurants, cafes, takeaways, visitor attractions and B&Bs that not only offer a quality food and drink experience, but include and promote Scottish produce on their menus, giving consumers more choice. 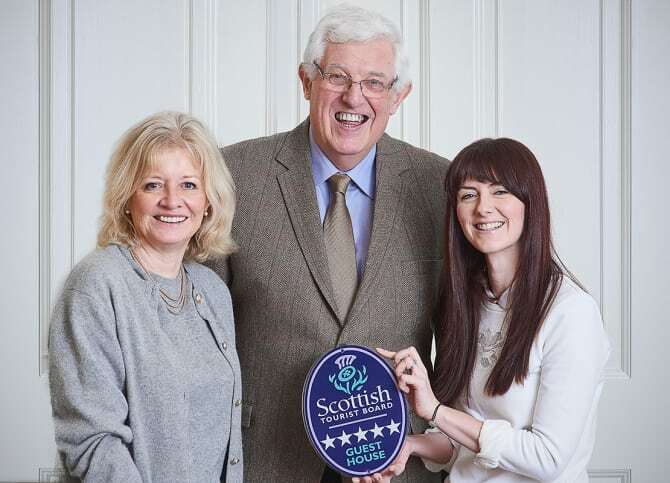 Jo Robinson, Regional Director at VisitScotland, said: “I would like to congratulate Sheena and Graham on their award and also on their sympathetic renovation of Blervie House – it really is a little bit of luxury away from home and five-star status shows visitors that they can expect a high quality experience. “Quality Assurance is about more than just the stars on the door – it’s about the entire visitor experience and driving improvement in that experience throughout Moray Speyside. Graham and Sheena said they were proud and delighted to receive the award, particularly as they only began trading four months ago. Sheena added: “We want to offer our guests a luxurious but relaxed stay in our home and hope people will arrive as guests but leave as friends. Part of staying at Blervie House means being introduced to this stunning part of Scotland and the endless activities and adventures available from the house. There really is something here for everyone whatever your interests. This entry was posted in Business, Hotels, Tourism, Travel, Travel Awards, Travel Management, Travel Services, Travelers and tagged Blervie House, Five-Star Guest House status, Forres, Jo Robinson, VisitScotland. Bookmark the permalink.